Smoothies are a go-to for me especially during the summer when there’s triple digit heat and 99% humidity. I have no interest in standing in a hot kitchen cooking and for me that includes healthy, hippie foods. So what to do? To me making a smoothie is like making a salad – you can pretty much have any vegetables in the refrigerator and come up with a salad. For me, I can look in the refrigerator, grab some random fruits and veggies and in moments I have a nutritious cup of goodness that helps get me through the day. Nut butters, nuts & seeds, a variety of fruits and veggies, protein powders, green powders – the possibilities are all but endless. I often make my smoothies with a combination of both fruits & veggies. This is key for getting the required number of servings (vitamins!) per day. A green smoothie will help jump start your day faster than any cup of coffee and will help you maintain that energy throughout the morning instead of sending you crashing. Though sometimes smoothies require some peeling and chopping in the all-around they’re quick and easy. I can often be seen driving down the road with a quart container of smoothie. Many containers are BPA free and come with tightly fitting lids. Don’t like plastic? Then mason jars with lids are your new best friend. A few drops of liquid soap and a bit of water and you’ve turned your blender on self-clean! Put the lid on; give it a whirl, then rinse. Take it apart to dry and you’re done. Smoothies are a wonderful way to add greens to your diet, especially if you’re not fond of greens! 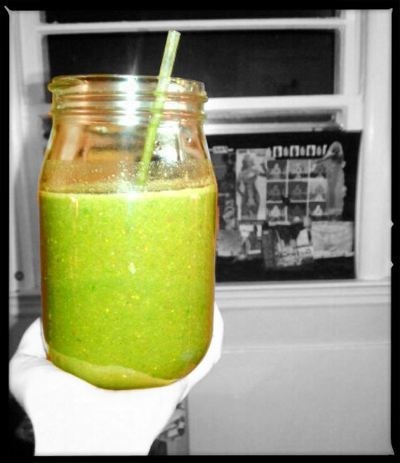 Spinach, kale, arugula, lettuce, microgreens, wheat grass, spirulina – you name it and it can go in a smoothie. And often, except for the vibrant color, you’d never know there were greens in it. Fruits provide much needed water. So when you’re drinking smoothies that have the addition of the fruits of plants (including cucumber and tomatoes) you’re adding extra water to your daily intake. Don’t be afraid of what can go into a blender (and mine is not a Vitamix!). Beets & carrots do just fine in the blender! If you think it sounds good it probably will be if you base your smoothies off your taste preferences. Let’s face it – in the world of health food there are many things that are an acquired taste but so many smoothies don’t fall into that category. They actually taste good!